In this chapter, the steps required to set up an SMS gateway will be explored. Once configured, you will be able to send text messages to individual contacts and mass mailing lists within jManage. You have two provider choices: Clickatell or Twilio. 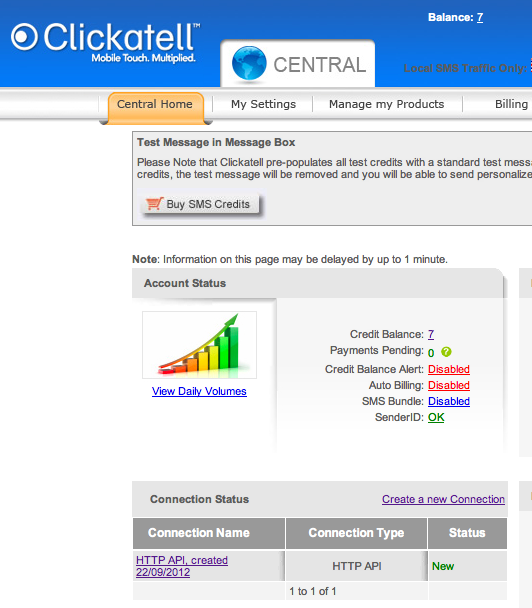 In the Central Home dashboard, click "Create a new Connection" under "Connection Status"
Replace leading zero: enable this option if phone numbers against your contacts begin with "0". For delivery to be successful, all numbers must begin with the country code if this is not enabled. Enable IP Address Restriction: This is not available with jManage. Click "Submit and Get API ID" to generate an API ID, and on the next page, make a note of it. Go to the Twilio website (http://www.twilio.com) and sign up for an account. You can create a trial account and test, but you will need to upgrade your account in order to send SMS messages properly. 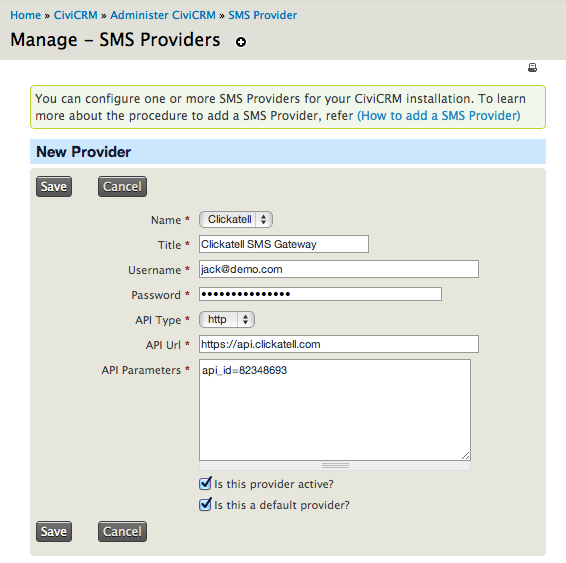 In the Manage SMS Provider Page, the providers that are enabled are available. Choose Twilio. Type some name for your sms provider in the Title textbox. The Username is the AccountSid. From=+12345678901 (enter +1 in front of your number, no spaces, dashes or brackets in the number). Swap 1 with the country-code of your Twilio phone number, ie 1 is the country code for USA and Canada.